I’m going to go right out there and say it: Mini Eggs are the absolute best part about Easter. Their crunchy, sugary shell, their heart of chocolate… I could go on. 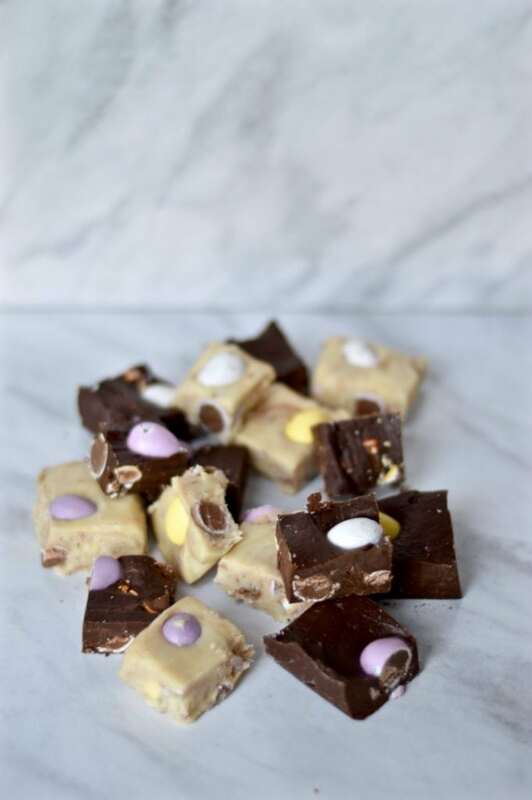 But more importantly there is a way to make them even better: make them into mini egg fudge. 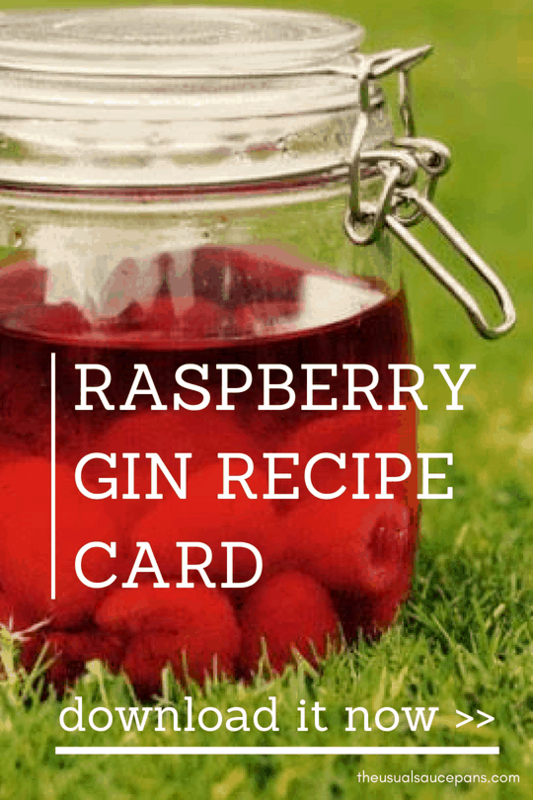 What could be better than a really easy recipe that will have people falling over themselves to get another piece? 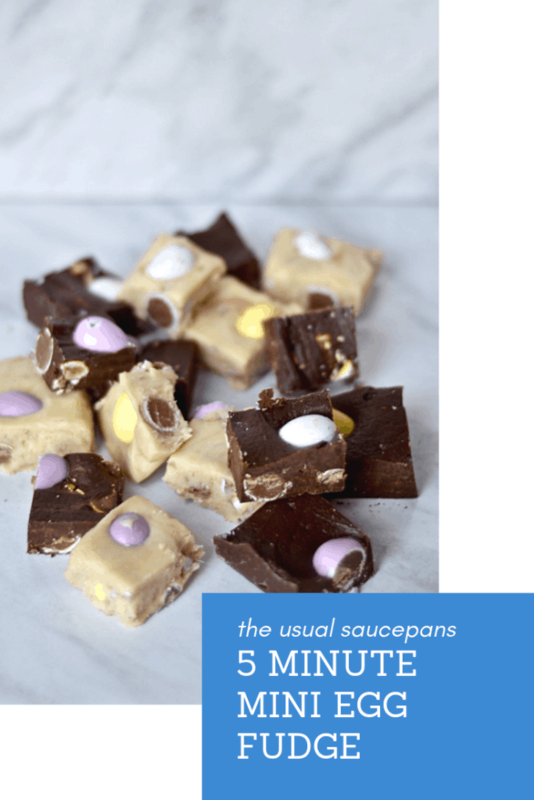 This is my favourite fudge recipe because it’s also insanely easy. If you want to do it in a hurry it will literally take about two minutes of your time. Sure, there’s no denying that it’s a little passed ‘unhealthy’ and ‘too sugary’, but it’s not something you’re meant to eat boatloads off. It’s a treat. Something to have a square or two of. The trick to this recipe is that it uses condensed milk. 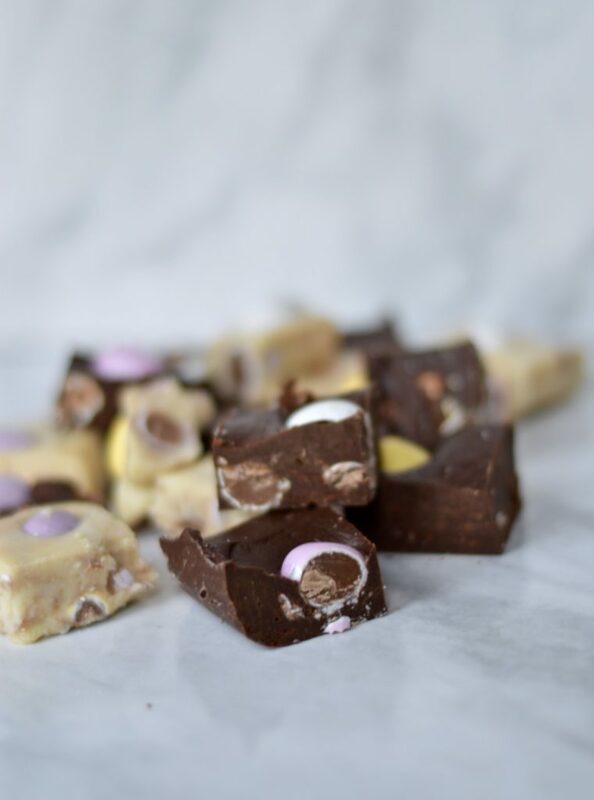 This, along with the melted chocolate, essentially the two of these combined ensure that your fudge will set, but set in a way that is smooth, creamy and delicious. There are also two ways to make it. If you’re really strapped for time, you can melt the chocolate in the microwave. This will take about 30 seconds, but does risk burning the chocolate. Your other option is making a bain-marie. Fancy as that sounds, it’s basically a pot with some boiling water in it and a bowl over the top. 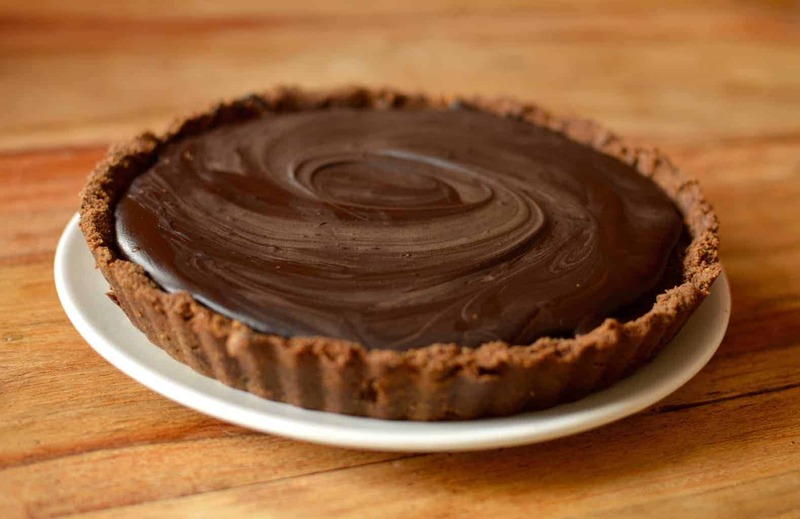 The chocolate will melt slightly slower this way, but it is the safest way to ensure your chocolate melts and you can whisk it smooth. 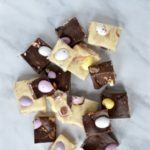 Whilst the best part of this Mini egg fudge recipe is, of course, the Mini eggs, it is also entirely customisable. In the recipe below there are two flavour combinations – dark chocolate and orange, and white chocolate and vanilla. Really though the options are endless. It is about picking the flavour combinations that will make you smile. 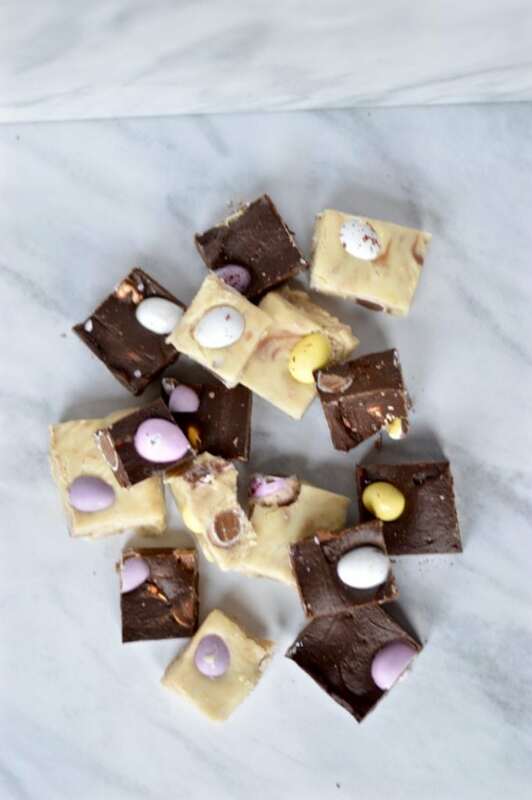 If you want to make two versions, simply do it in two batches and put a break half way down the tray you are setting the Mini egg fudge in. I used a piece of tinfoil. But mini eggs are ridiculously expensive and I just want to eat them! I hear you. How is a pack that feels like it’s got less than a handful in it about a pound? Well, many reasons about marketing, time-scarcity and other sensible-ish reasons, but let’s be real, half your pay check for a few bags to make fudge seems a bit much. Helpfully though Aldi are currently doing their own version. No one will taste the difference and they’re 69p a bag. Winning.